Administrator Quarterman has announced her departure from the Pipeline and Hazardous Materials Safety Administration (PHMSA), effective October 3. She will join Atlantic Council, a Washington, DC think tank focused on international affairs, where she will serve as an expert on responsible energy development. Ms. Quarterman has served as Administrator since her nomination by President Obama in 2009. No replacement has yet been identified. On September 18, PHMSA issued an advisory bulletin addressing the regulatory and safety impacts of flow reversals, product changes, and conversions of service for gas and hazardous liquid pipelines. In conjunction with the advisory bulletin, PHMSA issued a new guidance document that provides additional information and recommendations for operators to consider before undertaking these activities. Together, the advisory bulletin and guidance document address on the notification, operation and maintenance, and integrity management implications of flow reversals, product changes, and conversions of service. Notably, the guidance suggests that pipelines with certain design and operational characteristics should not be considered for these changes. While not directly enforceable, these documents reflect current PHMSA policy on the regulatory requirements implicated by these events and warrant careful consideration. The guidance indicates that PHMSA now seeks notification of project activities far earlier than previously indicated. PHMSA also states that the notification requirements for “10 or more miles of new pipeline” apply to both new construction and replacement of 10 or more miles of existing pipe. On September 22, GAO released an August 2014 congressional report examining the impact of increased domestic oil and gas production on pipeline and rail transportation infrastructure and safety. The report concludes that pipeline infrastructure development and expansion have not kept pace with the increasing rate of oil and gas production. 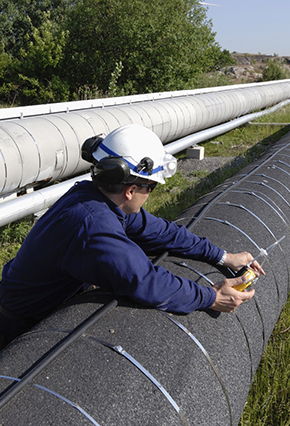 GAO also expresses concern over PHMSA’s delay in establishing new safety standards for unregulated gas gathering pipelines, particularly large-diameter, high-pressure lines, which have been constructed to serve growing development in gas shale plays. GAO recommends that PHMSA move forward with a notice of proposed rulemaking addressing the safety risks associated with these lines. PHMSA forwards Public Awareness Program information collection request to OMB. On September 23, PHMSA issued a notice that it is forwarding an information collection request relating to written Public Awareness programs to the Office of Management and Budget (OMB). PHMSA previously issued a notice regarding this information collection request on June 24 and received no comments. The notice provides an additional opportunity for comments, and directs that they be submitted to OMB by October 23, 2014. PHMSA schedules Advisory Committee meetings. On September 18, PHMSA announced a joint public meeting of the Gas Pipeline Advisory Committee and the Liquid Pipeline Advisory Committee on October 21-22. The committees will discuss performance metrics for pipeline operations, safety management systems in other industries, and agency, state, and stakeholder priorities. The meeting will be held in Washington, D.C. Updates on status of PHMSA Rulemakings. The table below reflects information on the status of PHMSA rulemakings as reported in the Department of Transportation’s (DOT) September Significant Rulemaking Report. Additional information from the OMB Office of Information and Regulatory Affairs (OIRA) is here. AB 1937 (Gordon) (now Chapter 287, Statutes of 2014): This bill amended the California Public Utilities Code to require gas corporations to provide at least three working days’ notice before undertaking any non-emergency excavation or construction activity within 500 feet of a school or hospital. A Senate amendment that would have required excavators or operators to comply with the state’s one-call notification requirements was removed from the bill before enactment. The Governor signed the bill on August 25. SB 1371 (Leno) (now Chapter 525, Statutes of 2014): This bill requires the CPUC to adopt rules and procedures, while giving priority to safety, reliability, and affordability of service, to minimize natural leaks from CPUC-regulated gas pipeline facilities, with the goal of reducing greenhouse gas emissions. The regulatory proceeding will commence by January 15, 2015, and the rules and procedures would be required to meet the following objectives: (a) provide for the maximum technologically feasible and cost-effective avoidance, reduction, and repair of leaks and leaking components within a reasonable time after discovery; (b) provide for the ranking or recorded leaks and leaking components by volume or energy content; (c) evaluate natural gas leakage abatement practices to determine effectiveness; and (d) establish and require the use of best practices for leak surveys, patrols, leak survey technology, leak prevention, and leak reduction. CPUC also must require gas corporations to file reports detailing their leak management practices, new methane leaks by grade, existing methane leaks, and a best estimate of gas loss due to such leaks. The bill was signed by the Governor on September 21. On August 21, 2014, the Kansas State Corporation Commission announced a public hearing on proposed amended regulations adopting the 2013 version of the federal gas safety standards set forth in 49 C.F.R. Part 192. In addition, the proposed amendments would remove the 5-day repair requirement for class 1 leaks; permit utility companies to supervise repairs of natural gas lines in residential areas by defining “yard line” to end at the outside wall of an individually metered residential premise; and simplify the fee collection schedule for safety inspections and supervision by removing outdated assessment information. New Mexico Public Regulation Commission initiates rulemaking on excavation and One-Call Requirements. On July 9, the New Mexico Public Regulation Commission proposed to amend its rules for excavation damage prevention and One-Call programs. The proposed amendments would require the establishment of a “positive response registry system,” and update underground facility operators’ (UFO) response requirements to excavation locate requests to include a “positive response” even if the UFO determines it has no facilities within the proposed excavation limits. The proposed amendments also would make failure to provide positive responses, pre-mark the intended site, or report damage a “willful” violation. A public hearing was scheduled for September 24. Adoption of regulations regarding federal requirements and farm tap odorizers. On September 16, the Railroad Commission of Texas (Commission) adopted regulations that update the minimum safety standards by incorporating certain federal pipeline safety regulations that are effective on the date of the amended rule. The Commission also revised its regulations to clarify that wick-type farm tap odorizers are exempt from certain equipment reporting requirements, but must continue to comply with gas odorization requirements. The adopted regulations are expected to become effective on October 6. Washington adopts civil penalty cap increase. Effective on October 4, the Washington Utilities and Transportation Commission (WUTC) will have the authority to impose increased civil penalties for violations of its intrastate gas pipeline safety regulations. As a result of an amendment adopted on September 3, the maximum per-violation penalty will be increased from $100,000 to $200,000 per violation, and the maximum penalty for a related series of violations will be increased from $1,000,000 to $2,000,000. These penalty caps are consistent with the limitations in the federal Pipeline Safety Act. More information is here. Public Service Commission of West Virginia Appoints Director of Pipeline Safety. On September 2, the Public Service Commission of West Virginia announced the appointment of Mary S. Friend as Director of the Gas Pipeline Safety Division. Mrs. Friend previously worked in PHMSA’s Office of Pipeline Safety Inspector Training and Qualification, where she developed and taught training courses for federal and state inspectors.